Keeping the creative juices flowing in the summer is important to me, so when L mentioned that he wanted to make crayons in various shaped molds in the oven, I was excited that he was being creative but it was also a VERY hot day and I REALLY didn’t want to turn on the oven. I didn’t want to say no, but I also didn’t want the house to be the temperature of a Bikram Yoga studio, so I proposed that we make a solar oven instead. Solar ovens are amazing little contraptions. They work by trapping and converting sunlight into heat energy that is retained for cooking. 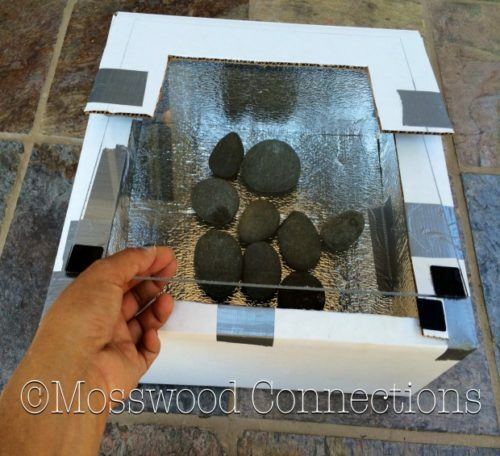 You can bake, boil and steam in a solar oven so they are quite versatile for cooking (or melting crayons in various shaped molds, which is what we wanted to do). Sun Ovens can be purchased online and range in cost from between $75.00- $200.00 (or more). But why buy one when you can make one yourself for less than $6.00? One medium-sized box (cardboard is okay). 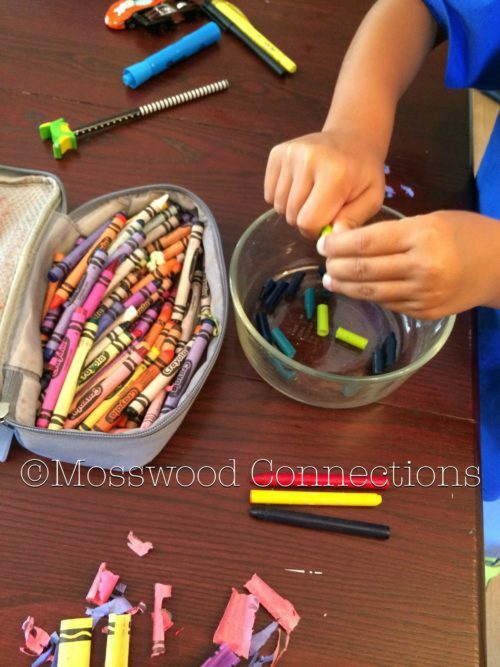 Note: For the melted crayon activity you’ll need a bunch of broken crayons and silicone molds. Note: We bought our supplies from neighborhood stores. We have added links to the products for your convenience. Prices may be different. Constructing the solar oven was easy and fun! We lined the inside of the box with the sunshade which we cut to fit the box. Afterward, we cut out a window on top of the box and taped the plexiglass into the opening. We put the rocks and thermometer in the box and placed it in a sunny spot. 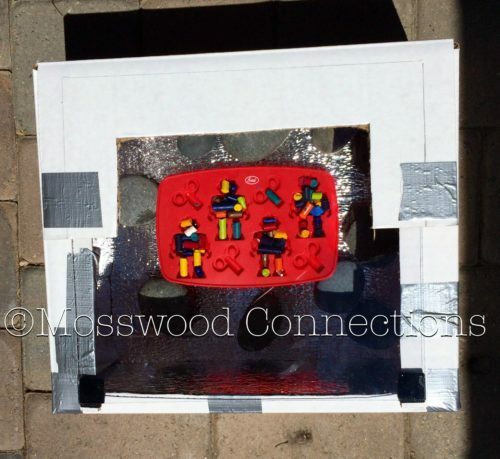 While the oven sat in the sun, L and I put broken crayon pieces into a silicon mold to create robot shaped crayons. It took about 20 minutes for the oven to heat up to 180 degrees. We put our silicone molds in the oven and it wasn’t long before the crayons began melting and the colors began mixing. We left the mold in there for about 45 minutes and then took it out (caution, this is an oven, after all, so the melted crayons in the mold will be HOT) and let it cool for at least an hour. Once hard and cool we popped our little crayon robots out of the mold and were ecstatic with the results. A few days later our neighbors came over and we shared this activity with them. Even though they’re all different ages (7, 4, and 2) it was a great playdate activity that kept all three kids captivated and engaged. Making a Solar Oven Created So Many Teachable Moments! 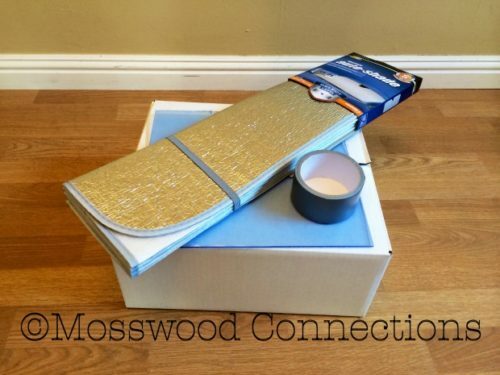 This activity lends itself to many teachable moments. During our interaction we discussed the greenhouse effect, we talked about the economics of cooking using solar energy (free!) versus using other resources that are finite. We talked about the cost of trying to keep the house cool (whether with air conditioning or manually opening/closing windows in the evening and morning). We also talked about the impact that using this technology has on people living in impoverished areas and several other topics. It was a great deductive and inductive reasoning activity and most importantly, it was fun. 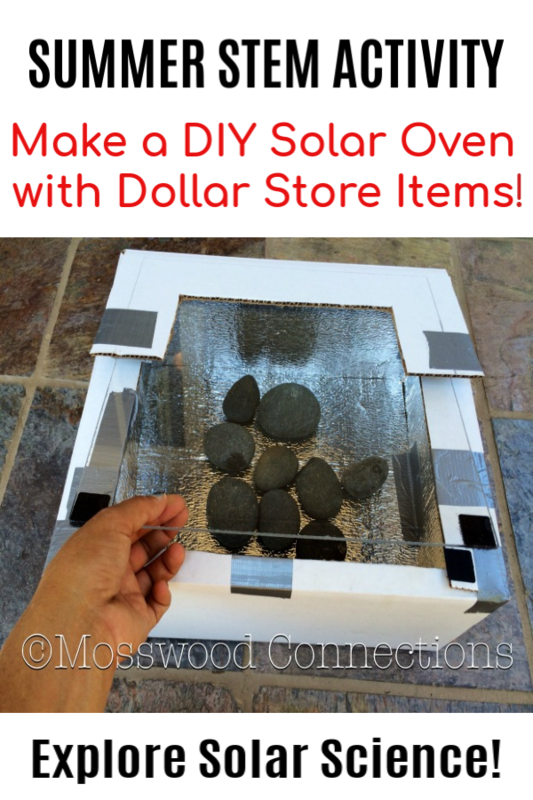 What would you make in your solar oven? Science Lesson from Making Freezer Bag Ice Cream: Explore solids, liquids, and the Scientific Method. Fun with Science and Art: Explore how different materials interact. Ivy and Bean; What’s the Big Idea: Kids learn about the environment by exploring literature and book extension activities. Make Butter While on a Nature Hike: Exploring food science and states of matter.